At Stellar Blue Technologies, we focus on the video capabilities drones can offer. We have a certified drone pilot on staff and have been taking full advantage of the numerous video possibilities drones can offer. Last year we flew over local landmarks and events, as well as indoors. This allowed us to provide dynamic interior footage. With the world of drones expanding and changing so quickly, make sure you have the right resources to stay ahead of the curve and give you an edge over your competition. 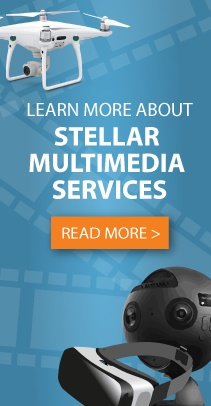 Find out more about the Stellar Blue Technologies Multimedia Services and how we can help you stand out from the crowd.